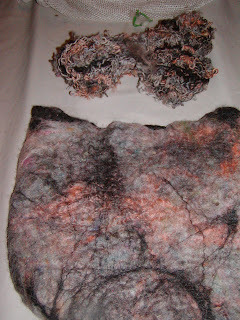 I have been asked numerous times to write up directions for the way that I teach felting. I spent yesterday afternoon felting this bag and spinning up a strap to go with it. I plan to list it for sale on my etsy shop. I photographed all of the steps and have started writing up the procedures. It would be done, if the Microsoft program did not keep shifting things around. Since there is no logic to how the things move, I don't know how long it will take me to get it straight! But, I thought I would let those who wanted to a copy know that it is almost done. I will have to charge for the instructions, if people want hard copies, because it is going to take a lot of ink! I believe that pictures tell more than words.